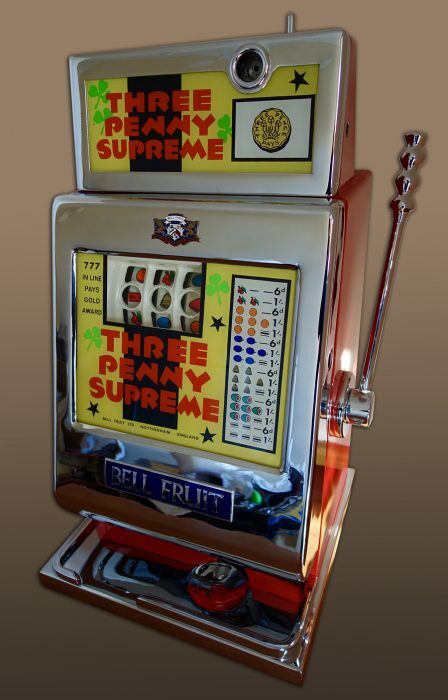 The gambling ingredient is the intoxicating, addictive substance of the slot machine trade. 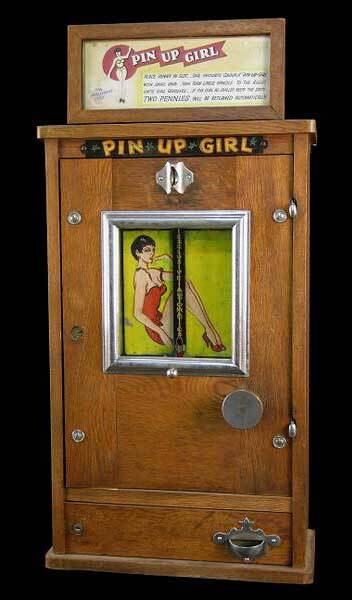 There's a dash of it in most amusement machines, but Gambling Machines are a hundred percent proof. Early contenders such as automatic payout roulettes with their single spinning disks were eclipsed by the arrival in 1905 of Charlie Fey's Liberty Bell. This established the iconic form we recognize as the one armed bandit, bell (in America), or three reeler, puller, fruit machine or more vaguely slot machine. Although legal strictures stifled their development here, several manufacturers made a business out of revamping and disguising bandits for the British market. 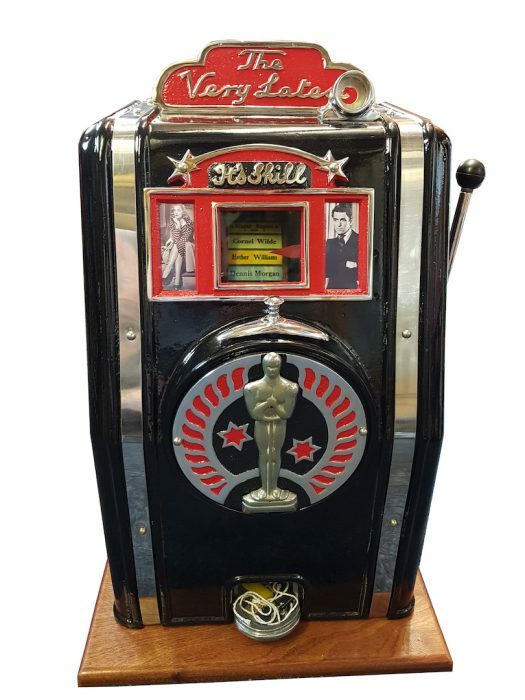 Others, by shunning the ubiquitous three reels and fruit symbols, produced some delightfully novel games that the authorities could not easily identify as gambling machines. Cubism seems to have influenced the exterior of this rare gambling machine but the result is a rather naive child-like appearance. 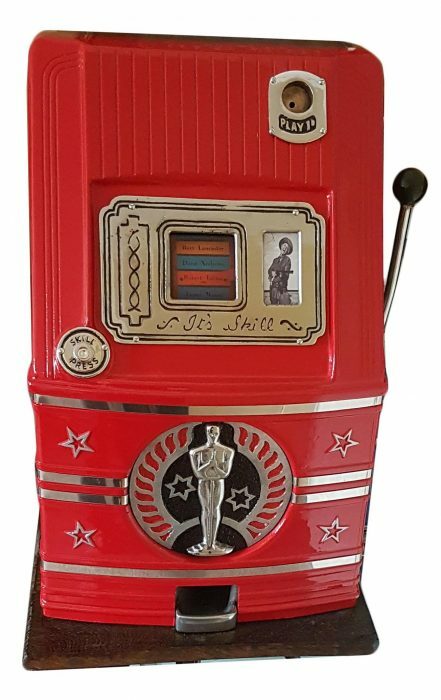 The game could be mistaken for a standard three reel bandit, which was perhaps the intention, but play is more akin to the Stockbroker concept as it employs the future-pay system (a winning combination is claimed by inserting another coin) and the payouts of 1, 2 and 3D are exceptionally stingy. These games started life as Pierre Bussoz Giruoettes, but were re-cased and restyled for the British market. 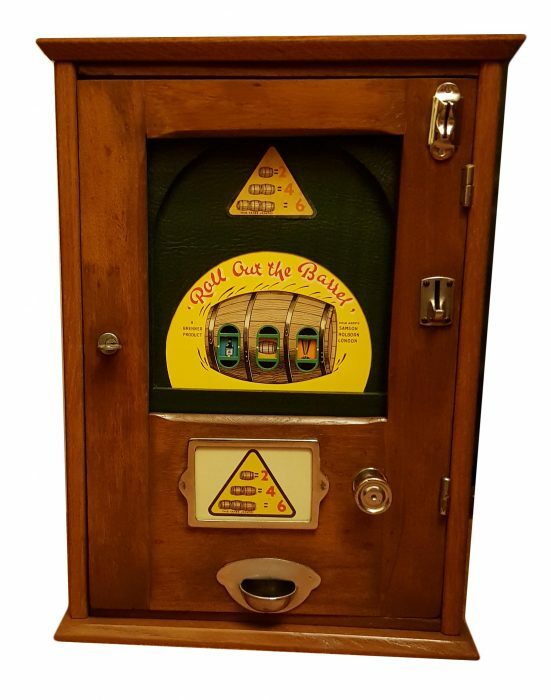 You placed your bet on one of three girls by turning the knob (bottom of frame) to green, red or blue. After cranking the handle, the image breaks into two fast spinning halves, before settling again on one image. A winner paid 2D. 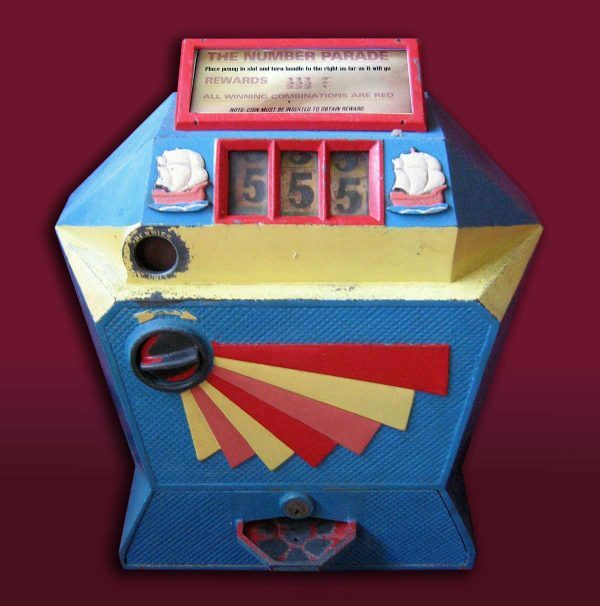 Brenner was one of several British companies that updated Jentzsch & Meerz Domino wall machines, giving them a new lease of life in the immediate post war period, when there was a demand for new games but no materials to make them. 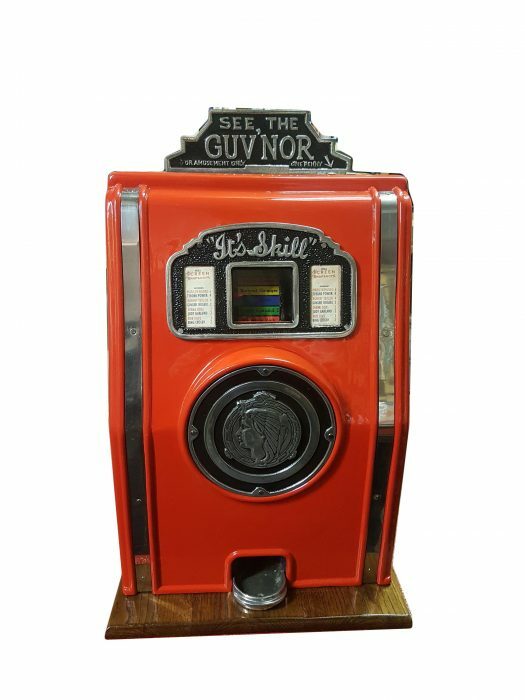 The dice and Edwardian players are replaced by drink symbols and the barrel motif. Unlike a standard one arm bandit, the three reels are independent, with each barrel winning 2D, allowing a maximum payout of 6D for three barrels. 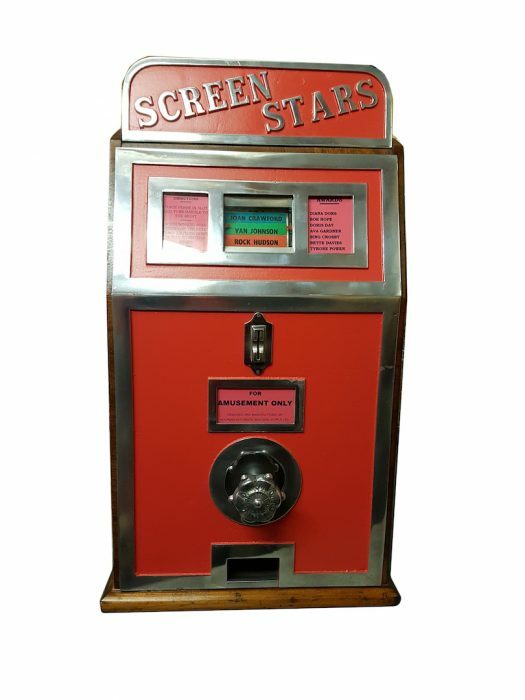 Although it resembles a plain looking but fairly standard 1950s one arm bandit, Screen Stars is entirely different inside and was designed to circumvent restrictions that applied to such games. This is achieved with a simple but ingenious mechanism which appears to spin the drum randomly but actually stops it on a predetermined cycle. Few examples exist and it seems likely that players would lose interest once they identified the sequence. Prizes are paid for certain popular screen stars of the day, including Diana Dors, Bob Hope and Doris Day. Three Alike was an early example of Bell-Fruit's mechanical bandits produced from tooling acquired from the Watling Manufacturing Co. in Chicago. The front-opening, modern look belie the rather ancient origins of its mechanism. 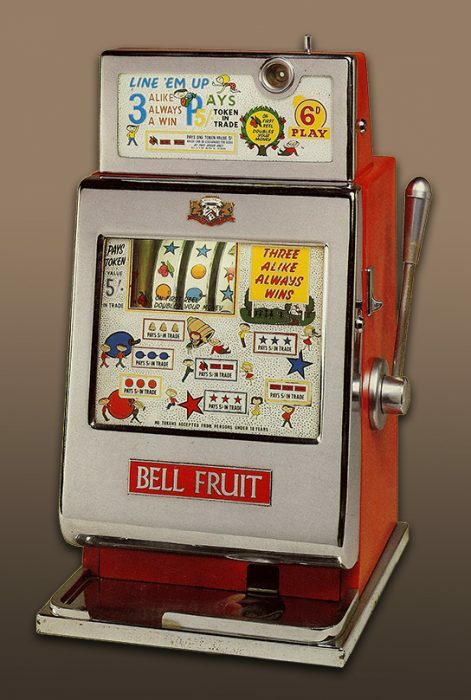 With its chromed front opening and light up glasses, this bandit is typical of Bell-Fruit's line of mechanical bar-top bandits. The 3D coinage, however, is the unique feature of Three Penny Supreme. Mackeson, Forest Brown, Final Selection and Brewmaster Export Pale Ale are a few of the symbols on the reels of this beer-themed bar-top bandit. 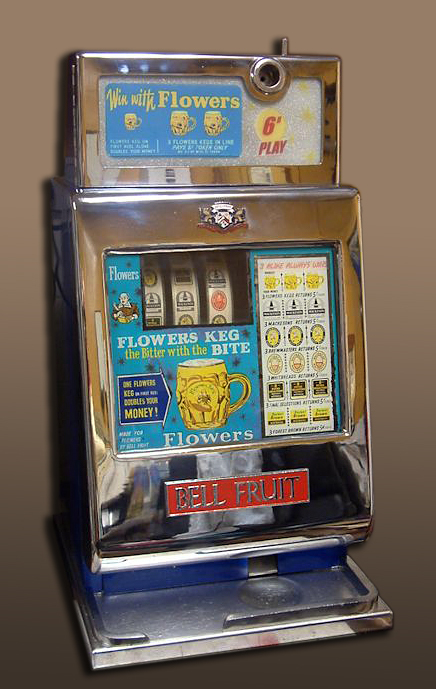 The theme arises from Bell-Fruit's strategy of locating their 'modern' bandits in British pubs in the 1960s by targeting breweries. Flowers brewery had been acquired by Whitbread (in 1963), hence the other advertised brews.